This is one impressive feat by Microsoft. Microsoft sure threw a curveball at us with the Xbox Scorpio’s specs. The overall picture—a box that’s capable of running Xbox One-quality games at 4K—is largely unchanged. Microsoft always maintained that Scorpio was, essentially, a premium 4K-capable member of the Xbox One family. Both in terms of the hardware specs and actual games up and running on Scorpio development kits, we can easily say that Scorpio fits the bill as a 4K Xbox One. However, the rumour mill appears to have gotten a surprisingly large number of things wrong this time. For starters, there was a lot of talk about the Scorpio incorporating a Ryzen CPU. This was a potential game-changer: if Scorpio’s massively upgraded graphics component was complemented by a processor upgrade, it would’ve been more of a generational leap. Without severe CPU bottlenecking, the Scorpio could potentially have delivered not just a higher-res output, but next generation gameplay features, richer worlds, better physics simulation, and more believable AI. This wasn’t, alas, to be. Much like the PS4 Pro, Scorpio’s Jaguar-based processor received a fairly hefty clockspeed bump (up to 2.3 GHz), and that was that. This certainly isn’t a bad thing. At 4K, Scorpio will mainly be targeting a 30 FPS update. Expecting any more, in all but a handful of first party titles, is asking a bit much. At 30 FPS, you’ve got twice as much breathing room. However, in simulation-intensive games, CPU constraints can crop up even at this lower framerate. Assassin’s Creed: Unity is a case in point. The original console release was barely playable on Xbox One and PS4—with hundreds of NPCs onscreen at the same time, both consoles experienced severe processor bottlenecking. On the PS4 Pro, performance appeared to scale near-linearly with the increase in clockspeed, enabling the game to consistently hit the 30 FPS threshold. We’d argue that the same holds true on Scorpio, which features a 10 percent faster CPU than the Pro: we’re not looking at a processing miracle here, just enough CPU grunt to ensure that minimum framerates don’t dip too far below 30 FPS. While the Scorpio’s CPU upgrade might be a bit of a downer, it’s the GPU that’s the biggest surprise. Microsoft’s been throwing around the 6 Teraflop figure ever since the Scorpio was outed at E3 last year. This defined certain parameters for how the Scorpio’s GPU could shape up to be. AMD’s midrange PC blockbuster, the RX 480, was the obvious reference point: based on the Polaris architecture, the 480 leveraged power efficiency and a small die-size, courtesy of it being manufactured on the 16nm process, to deliver powerful, yet cost-effective performance. Crucially, the RX 480 also offered compute performance in the range of 6 Teraflops. The Polaris 10 connection was reinforced by the fact that the PS4 Pro’s GPU was essentially Polaris 10, downclocked to 911 MHz. Analysts were initially doubtful of a Polaris 10 connection because of the laws of physics: the higher you clock a part, the hotter it runs and the more power it needs. You can’t feasibly clock a console GPU in excess of 1 GHz and expect it not to use up excessive amount of power and/or overheat. Til date, all eighth-gen console GPUs were derivatives of off-the-shelf AMD hardware. If a 36 CU part running in the 1.2 GHz range was infeasible, then we’re likely looking at a downclocked variant of a partially enabled Vega 10 with perhaps 56 CUs enabled. A cut-down Vega part, clocked conservatively, could deliver on all fronts. It would be (relatively) cheap, power efficient, and deliver performance in the 6 Teraflop range. This was the received perspective. It was what most sites and analysts (including ourselves) predicted. It couldn’t have been further from the truth. With Scorpio, Microsoft appears to have ordered a fully custom SKU with no clear counterpart in the desktop space. Scorpio’s GPU is a 40-CU part, clocked at 1172 MHz. It makes use of both Polaris and Vega-specific optimizations. Moreover, its paired with 12 GB of GDDR5 that offers 316 GB/S of bandwidth. Memory bandwidth and the additional compute units alone give the Scorpio an advantage over a vanilla Polaris 10 part. But what’s truly eye-opening is the fact that the Scorpio’s GPU is clocked at 1172 MHz, very nearly as high as the RX 480’s max boost clock. Console GPUs have traditionally been conservatively clocked for a variety of reasons. For starters, consoles are small form-factor boxes. In the desktop space, thermals are not often a major concern: any half tower or larger case with decent fans will offer you enough leeway to run just about anything (including those dreadfully hot Hawaii parts), without the risk of frying your components. With consoles, space is an inevitable constraint. You can’t build a console any larger than the smallest of small form-factor PCs. When space is at a premium, you can’t allocate extra space for heat dissipation. Additionally, consoles are limited in terms maximum power consumption. High end PCs can potentially use as much juice as air conditioners. With consoles, manufacturers have to think smaller: you can’t fit a mini nuclear power plant into a console-sized box. So far, the only solution for these two constraints has been to drop console GPU clocks well below the typical operating frequencies you’d see in a desktop environment. While this cuts down on power requirements and heat output, it does have significant implications in terms of performance. With Scorpio, Microsoft has leveraged the inherent efficiency gains from manufacturing on the 16nm node. 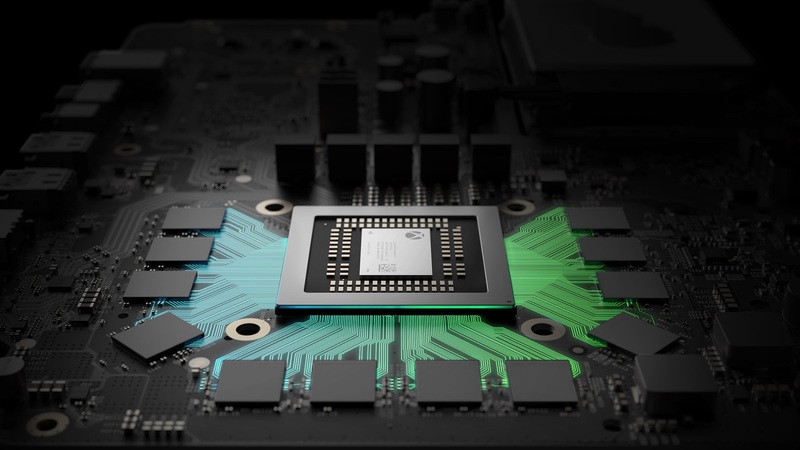 Because of the smaller die size, Scorpio’s GPU is inherently more power efficient than the Xbox One’s or PS4’s. A larger GPU built on the 16nm process can offer significantly higher performance while falling within the same power/thermal profile as a smaller GPU built on the 28nm process. This is what’s enabled Microsoft to go with a 40-CU part in the first place. But what of clockspeeds? The PS4 Pro’s GPU is also a Polaris-derived part, featuring 36 CUs. It’s, however, running at a much lower clockspeed, 911 MHz. GPU manufacturing isn’t an exact science. Every time TSMC or Global Foundries switches over to a new process node, they encounter teething issues. Yields—the proportion of viable GPUs per batch—are often low to start off with, increasing cost per unit and forcing manufacturers to either disable parts of GPUs or lower clockspeeds to allow slightly defective parts to make the cut. Given time, however, a process matures, as manufacturers gain practical insights and refine their process. Yields go up and, consequently, the baseline clockspeed for a given GPU can be increased. Scorpio’s evident clockspeed gains are likely due to the 16nm slowly coming into its own: this is something that we’re seeing in the desktop space with the RX 580. AMD’s base spec for the 580 has raised boost clocks by nearly 100 MHz. But, tellingly, custom RX 580s are coming to market clocked above 1400 MHz, unheard of with the 480 (I can vouch for this—I didn’t have much luck overclocking the RX 480). All in all, the process gains appear to be enough that Microsoft can squeeze the Scorpio’s GPU into a console-sized box, with a console-sized power budget to boot. Whatever the reason may be, that’s a mighty impressive feat in and of itself.